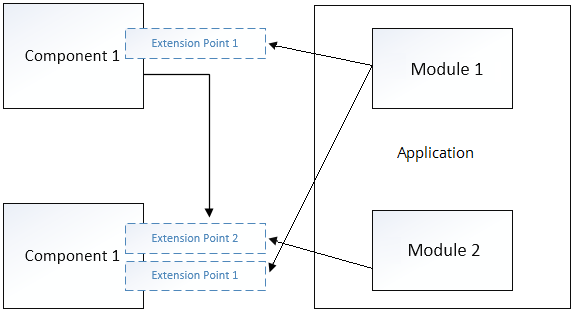 ELMA component model allows you to extend any system functions. For example, add menu items or buttons and process data. Component – an instance of the class that implements the extension point (interface) and is marked with the ComponentAttribute attribute. To initialize and work with ELMA core, there is the EleWise.ELMA.ComponentModel.ComponentManager class. It allows you to initialize the component model, register and receive components. When you start the ELMA server, the component manager loads the assemblies marked with the EleWise.ELMA.ComponentModel.ComponentAssemblyAttribute attribute and checks if they contain any components. Base classes for working with the component model are located in the EleWise.ELMA.SDK assembly in the EleWise.ELMA.ComponentModel namespace. IIniteHnadler – this extension point is used to process component’s loading. A component manager is created when the server starts. You can access it using the static property ComponentManager.Current. /// Returns the component of a specific type. The method is available at Initializing, InitCompleting and Initialized stages. /// Get types that implement the IXsiType interface. Classes with the ServiceAttribute attribute are registered with the class type and with all interfaces that the class implements. The EleWise.ELMA.ComponentModel.IInitHandler extension point allows you to subscribe to the start (Init) and end events (InitComplete) of the component manager’s initialization. The Init() method allows you to work with the current component manager (the static property ComponentManager.Current) and with the builder of the Autofac container (the static property ComponentManager.Builder). For more information, please see ELMA core architecture. The InitComplete method allows you to work with the current component manager and with the Locator class (for more information, please see ELMA core architecture). When you create the MenuController object, the MenuExtensions property will be filled automatically, if at least one component with the implementation of the extension point IMenuExtension is registered. Otherwise, the property will be Null. Please read ELMA core architecture for more information about the Locator class.